At present, with the massive increase in data transmitting and the need for real time data travel within the network, Ethernet switching technology has evolved greatly over the last decade. As a result, the existing aging three-tier design has been replaced by the new leaf and spine architecture in data centers. This new network architecture requires specially designed leaf switch in order to work. So how much do you know about leaf switch? Here we’ll explain this data switch in this article. As the figure1 shows, a leaf-spine architecture is usually composed of spine switches and leaf switches. Leaf switch is used to gather the traffic from the server nodes, then link to the network core that consists of spine switches. In this case, every leaf switch connects to every spine, which contributes to minimizing the network latency and bottlenecks. Therefore, the leaf and spine architecture allows for huge amounts of bandwidth and provides a high level of redundancy. Commonly, a traditional model includes three layers, core, aggregation and access. And most data center services and functions run on physical hardware that drives “north-south” traffic. If there are some east-west traffic that needed to be transferred across the traditional model, devices connected on the same access layer contend for bandwidth. 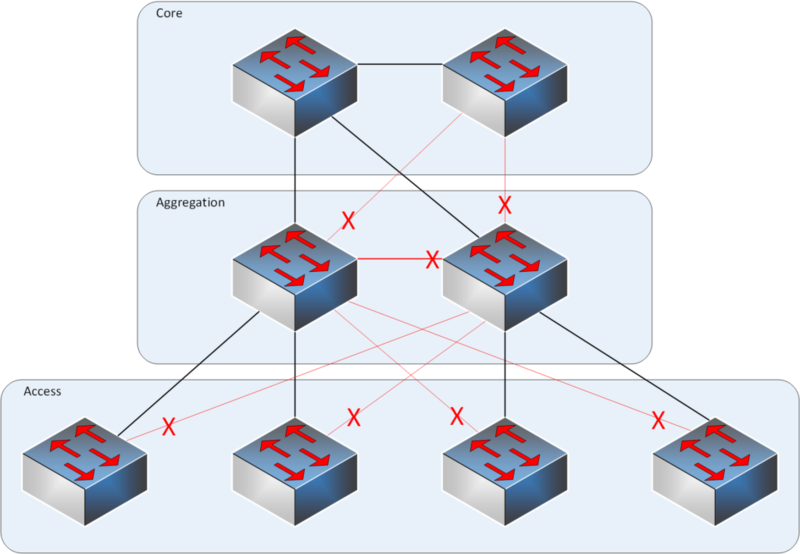 Therefore, congestion will be created between the access and aggregation layer. Unlike the traditional three-tier, the access layer of leaf-spine structure is formed by each leaf switch that is directly connected to each spine switch. And this direct connection helps to minimize the traffic bottlenecks and latency, and utilize the networking protocols and methodologies to create a dynamic network. As described above, we know the advantage of leaf-spine model is the improved latency and reduced bottlenecks. With this new approach, only a few data switches are needed to create a large and non-blocking fabric. This is the main advantage that makes it popular in networking system. In addition, leaf-spine uses all interconnection links. This means an additional spine switch could be added and the uplinks can be extended to each leaf switch, which can increase the interlayer bandwidth. Therefore, it allows the network to scale without managing or disrupting the Layer 2 switching protocols as the traffic grows. To keep pace with the market needs, FS.COM has produced S5850 series 10GbE switches for using as leaf switches, including three products. We’re going to see these three leaf switches. These three leaf switches are made of the same robust materials. All of their airflow directions are front-back. From the table, we can see that all S5850 series products support MLAG, SNMP, SFLOW and son on. So you can choose one according to your demands. 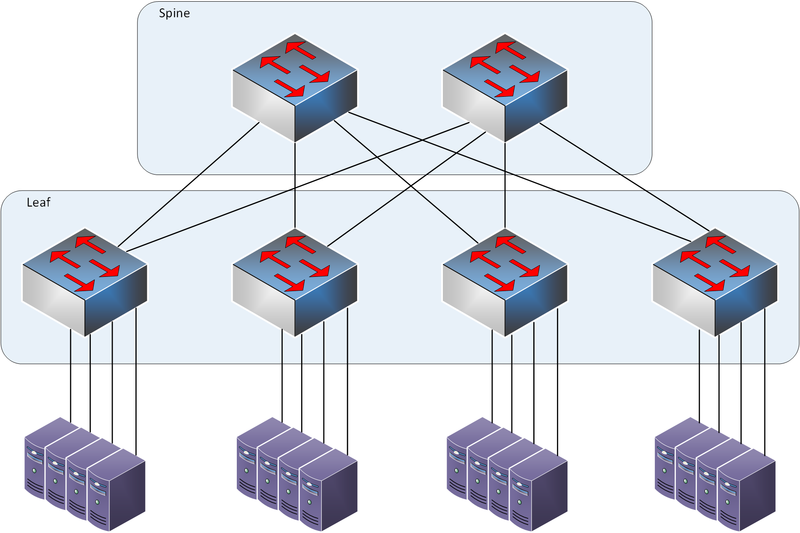 Leaf switch and leaf-spine architecture make the network more flexible. And FS S5850 series data switches are the quite cost-efficient selections. FS provides a full line of network switches including 24 port switch, 48 port switch and 1G switch, 10GbE switch and 40GbE switch. Come and choose the suitable switch.